Pharrell, Adwoa, And More Celebrate A Denim Icon – Spotlight Report "The Best Entertainment Website in Oz"
Pharrell Williams – musician, producer, and G-Star RAW’s co-owner and Head of Imagination – stars in the brand’s Fall/Winter 2017 campaign alongside a diverse and dynamic collective of creatives, including Adwoa Aboah, Jean Campbell and Lennon Gallagher. More than just a campaign, the imagery and video sees some of the most talked-about stars of the moment showing how they wear the iconic GStar Elwood in their own unique way. “For this campaign we specifically chose outspoken individuals with their own sense of style. The energy that happened when this talented group of people came together was beautiful, what set them apart actually brought them together,” Pharrell Williams commented of the campaign shoot. Art directed by Ronnie Cooke Newhouse of House + Holme and photographed by Collier Schorr, the campaign sees Adwoa Aboah – international cover girl, mental health advocate, and founder of Gurls Talk, a multimedia platform creating a safe space for young women to share their stories – alongside her younger sister, Kesewa; fellow models Jean Campbell, India Graham and Brooke Perry; Scottish actor and campaigner Connor Newall; and Lennon Gallagher – model and son of Oasis frontman Liam Gallagher. The video features the stars talking about their view of the world they live in, and what matters to them right now: from “friendship”, “inclusion” and “solidarity”, to “individuality” and “owning what you’re about”. The talented group are all known for speaking their mind and all chose to wear the G-Star Elwood in their own singular way – from Brooke Perry‘s flattering highwaisted fit, to Adwoa Aboah‘s loose menswear styling. The shoot shows that despite their different looks and diverse backgrounds, each can take the style – an icon of the denim world for more than two decades – and make it their own. The G-Star Elwood is a symbol of innovation and endures as one of the most recognisable jeans in history. Created in 1996, the Elwood was the first pair of jeans ever to be constructed using the 3D method – being built around the wearer rather than with a traditional flat pattern. Innovative and recognisable, it is also a symbol of individuality, since its construction means that it looks unique on every single body. The campaign also previews G-Star’s latest product innovations: EarthColours – new and all-natural dyes applied to the iconic Elwood design – and the second series of G-Star Elwood X25, curated by Pharrell Williams and expected to launch later this year. The Fall/Winter 2017 campaign launches September 2017. 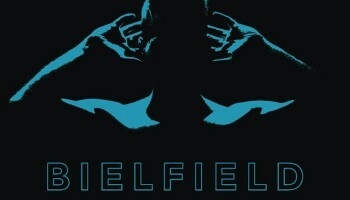 Introducing: Bielfield and his catchy new tune ‘Frequency’!